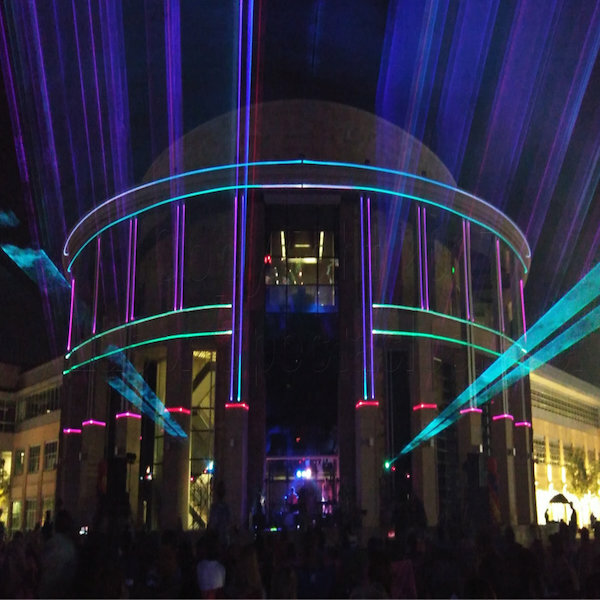 LASER SPECTACLES, INC. is a Texas Laser Light entertainment production company specializing in producing laser shows, and designing and installing laser show related projects. Sound and light are merged to produce stunning effects. Tim is especially proud of his building work. Here are some recent examples. 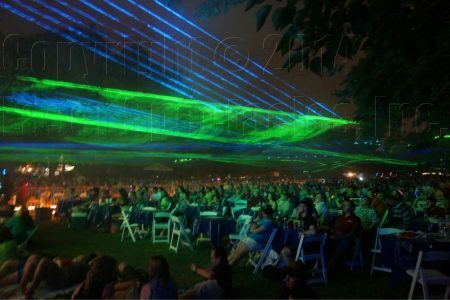 Laser Spectacles, Inc. focuses on producing creative and unusual laser shows for a variety of markets, including festivals, fairs, meetings, art events, parties, sporting events – anywhere large groups of people gather to celebrate! Here are some frequently booked examples of their work in picture format. Remember with lasers the more dimensions you are able to view the better so know that what you will get is even more laser spectacular! Laser Spectacles is a part of the Texas Commission on the Arts Touring Roster. Support for Texas schools, libraries and non-profit organizations may be available to assist with booking fees through the Cultural Connections Performance Support grant application. Contact TCA at 512-463-5535 for more information. Laser Spectacles, Inc. has received over 26 international laser display awards since its inception. * Second Place – ILDA’s 2003 Awards for Outstanding Laser Display, for “Walking Stick”, a piece for graphics combined with beams, and true synaesthesia style music. * Third Place – ILDA’s 2003 Awards for Outstanding Laser Display, for “Wyrms w/Bowties”, a piece for graphics combined with beams, and true synaesthesia style music. * Second Place – ILDA’s 2003 Awards for Outstanding Laser Display, “Special Application” Category, for “Taps”, a piece for tenor saxophonist, graphics combined with beams, and true synaesthesia style music. * Second Place – ILDA’s 2002 Awards for Outstanding Laser Display, for “Throbber”, a piece for graphics combined with beams, and true synaesthesia style music. * Third Place – ILDA’s 2002 Awards for Outstanding Laser Display, for “Sidewinder”, a piece for graphics combined with beams, and true synaesthesia style music. * Honorable Mention – ILDA’s 2001 Awards for Outstanding Laser Display, for “MicroManiac”, a piece for stereoscopic 3D graphics combined with beams, in remembrance of Robert Burns, a mentor to many Central Texas computer whiz kids, nicknamed the MicroManiac. * Second Place – ILDA’s 2000 Awards for Outstanding Laser Display, for “Toshiba 3D”, a piece for stereoscopic 3D graphics combined with beams, for the Toshiba Corp.
* Second Place – ILDA’s 1999 Awards for Outstanding Laser Display, for “Ray of Light”, a piece for beams and graphics combined. * Honorable Mention – ILDA’s 1998 Awards for Outstanding Laser Display, for “MC303 Beams”, a beam piece directly controlled by a MIDI “Groovebox” sequencer. * Second Place – 1998 Brewster Awards, for “Sound is Laser”, a piece for laser graphics, and true synaesthesia style music. * Second Place – ILDA’s 1997 Awards for Outstanding Laser Display, for “Laser Jam”, a jam session featuring musicians and laser. * Second Place – ILDA’s 1996 Awards for Outstanding Laser Display, for “Sheets ‘n Waves, an original atmospheric beam piece. * Second Place – ILDA’s 1996 Awards for Outstanding Laser Display, for the laser-charged environment we created for the Waco, TX “Brazos Nights Festival”. * Third Place – ILDA’s 1996 Awards for Outstanding Laser Display, for “Flight of the Bumblebee”, created in Stereoscopic 3D for a client in Japan. * Third Place – ILDA’s 1996 Awards for Outstanding Laser Display, for “Powerful Flight”, an original stereoscopic 3D piece. * First Place – Special Events Category – International Festival Association, in conjunction with the City of Waco, TX and Pangolin Laser Software, for our production of “The World’s Largest Video Game” Interactive laser display at Waco’s ‘Brazos Nights’ summer entertainment series. * Second Place – Pangolin Laser Software’s 1994 Pangolin Prize, for our original production of “The Ballad of Dorie Miller” for the City af Waco’s Brazos Nights. * Second Place – Mixed Category – International Laser Display Association’s 1994 Awards for Outstanding Laser Display, for Tim Walsh’s performance on the Laser Harp, a unique and original visual musical instrument. * Honorable Mention – Beam/Atmospheric Category – International Laser Display Association’s 1994 Awards for Outstanding Laser Display, for our original music & beam showpiece, “Drumbeams” (we were the only American company to receive an award). * “Best Laser Show” – Lighting Dimensions International ’94 Exposition in Reno, Nevada, for our original stereoscopic 3D production of “Carol of the Bells” at our booth.